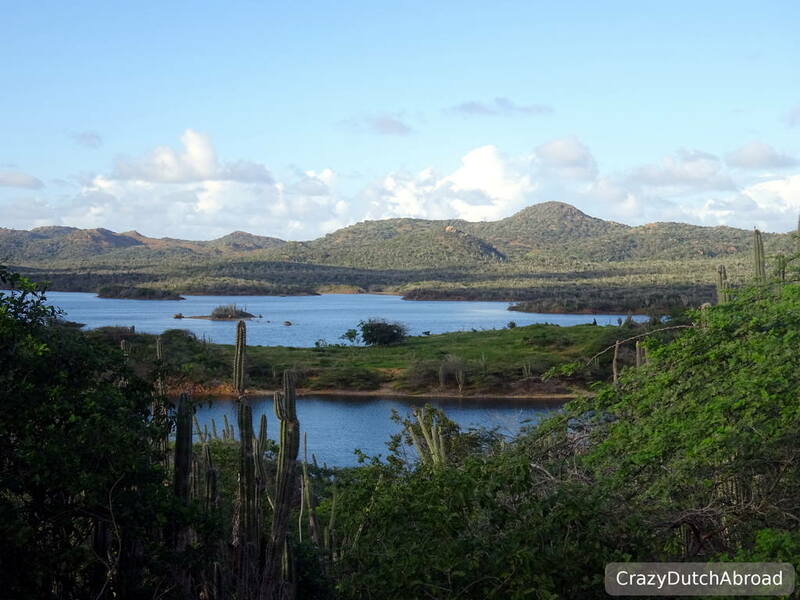 The Dutch Caribbean: Bonaire, Divers Paradise! With a 10-hour flight and a distance of about 7800 KM from Amsterdam - the Dutch Caribbean awaits you! 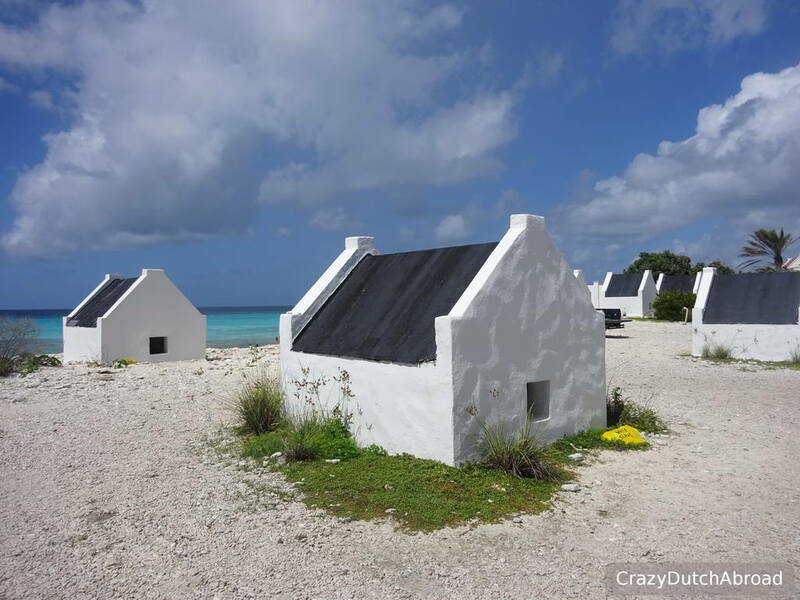 Bonaire, Saba and St. Eustatius are the three islands that shape the Dutch Caribbean as ‘Special Municipalities’ within the Kingdom of The Netherlands. As soon as we landed at Flamingo Airport the pink Caribbean vibes were all around. Bonaire island is almost 300 square km and has about 18000 inhabitants. It is a very popular cruise ship destinations and some ships arrive with 4000 guests, about 25% of the total inhabitants and about 1/3 of the people living in the bright colored capital Kralendijk. Can you image what happens when one of those huge cruise ships arrive? It is business time! All shops are open, souvenir markets pop up and all kinds of tours are suddenly on offer. 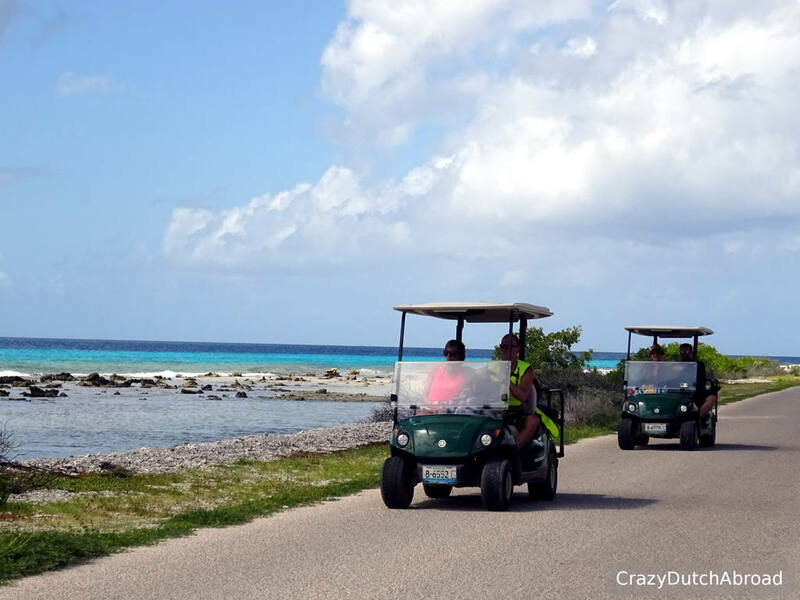 Golf carts, mountain bike tours, even a colorful sight seeing bus drives around. A few hours later, when the ships leave again - everything goes back to 'normal' and it goes slow - Antillean style I guess. Now it is really time to relax and enjoy the beauty of Bonaire! Bonaire is often awarded as the best shore dive destination in the Caribbean. The island is surrounded by the protected Bonaire National Marine Park in order to conserve the fragile marine life and reef. The water is clear, warm (30 degrees Celsius) and full of colorful sponges and reef fish! Bonaire consists of two islands. 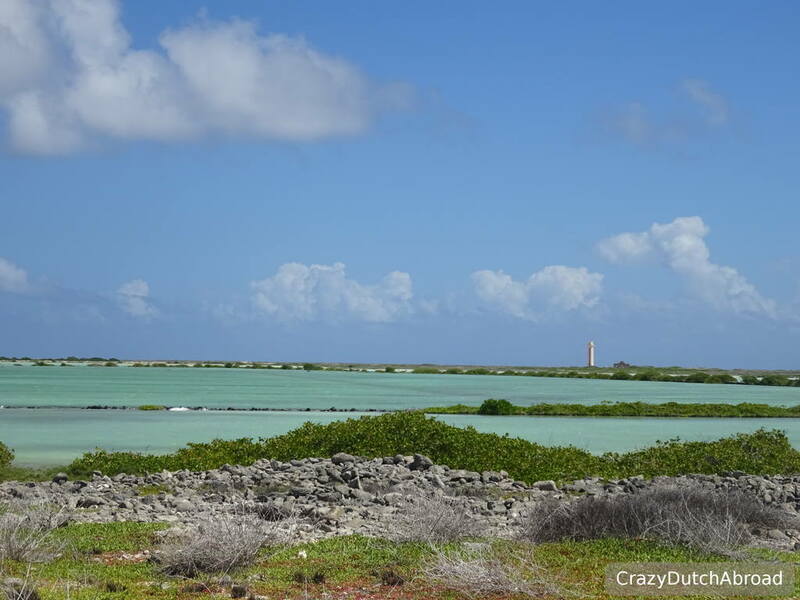 There is a little untouched island just off shore of the main island called Klein (Little ) Bonaire. Since less people dive or snorkel around here the reef is intact and in great shape. Sea turtles are often seen as well as Sea horses! Apart from the beautiful marine life you can find hundreds of bird species around the island. 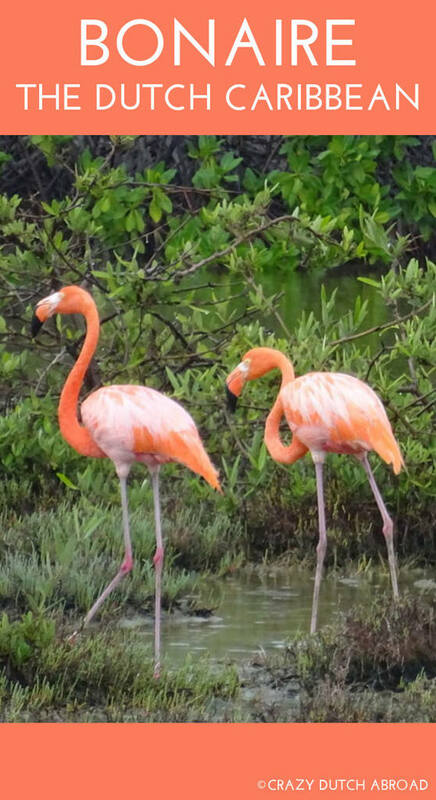 Flamingos are probably the biggest attraction as they roam free around the mangrove forests and lakes. 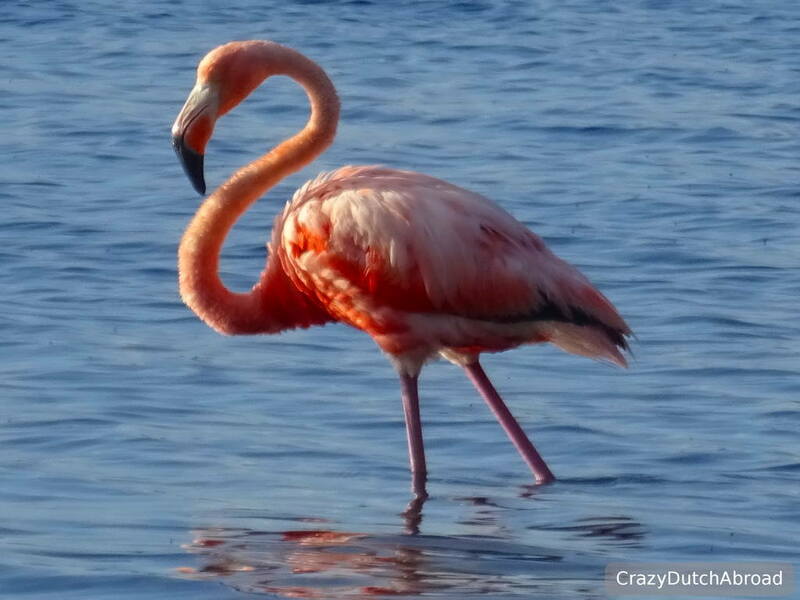 Their beautiful pink colored feathers are spotted easily from a distance, especially around the white salt pans. The Spanish brought donkeys to the island for labor hundreds of years ago, they also roam free and will often cross the road right in front of your car. With Spanish and Dutch mixing the occupation from 1500 to 1816 African slaves were also brought to the island for labor. The slaves were forced to work tending crops and in the salt pans. In the 1850 the iconic slave huts were constructed in the Southern part of the island, providing a place to sleep for the slaves who walked home for 7 hours in the weekend (to Rincon). 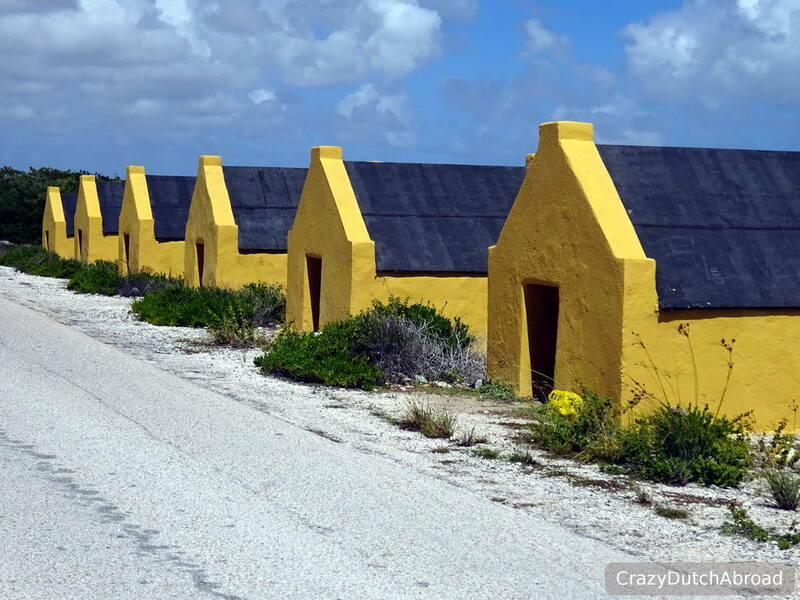 Bonaire has a history of slavery of which the Bonairians do not like to be remembered but the slave huts are still intact. They prefer to see themselves as descendants of the Indians, the original inhabitants of the island. 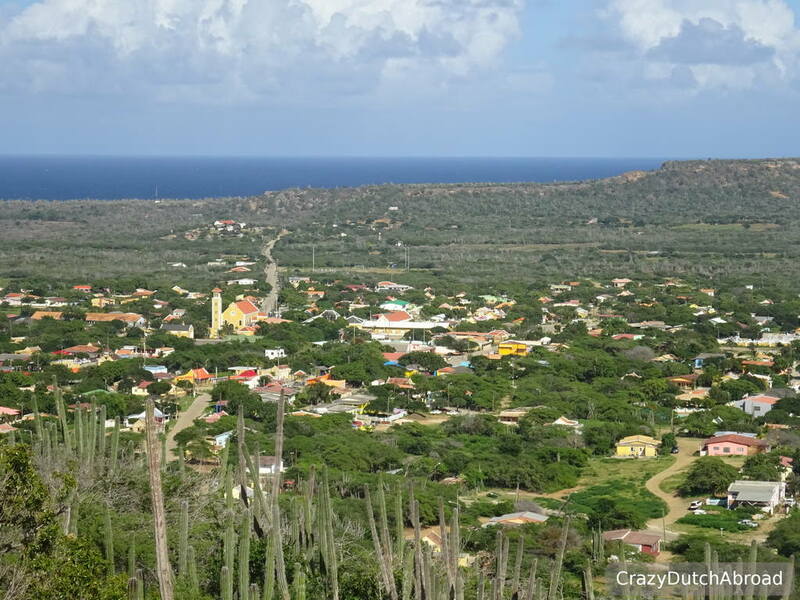 The nature of Bonaire is impressive, dry land with countless cactus plants, hills and even a mountain called Brandaris (240m). Lakes, mangrove forests and coral skeleton beaches are found around the island. 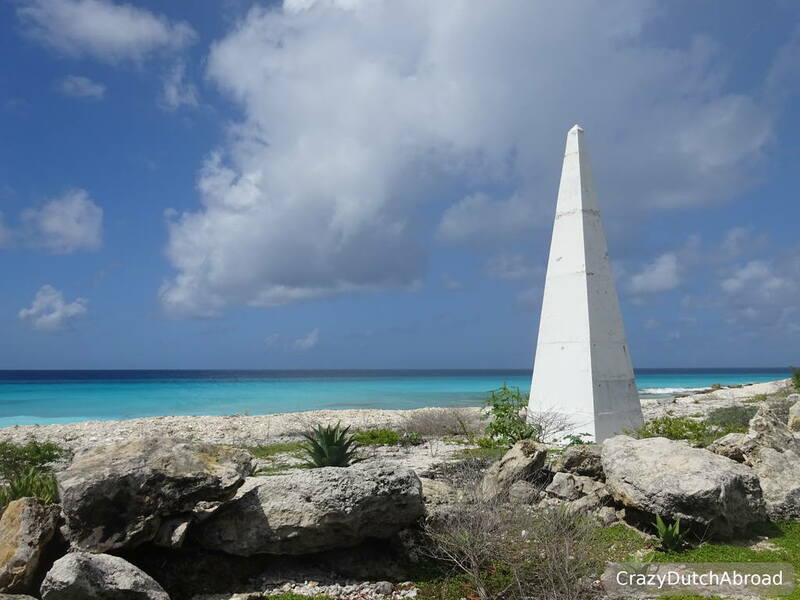 It is warm, dry and there is always a nice breeze on Bonaire. Wind surfing is very popular around Lac Bai in the South-Western part of the island. Franko Maps Laminated Fish Card. Map of the dive site locations and fish to encounter. Things to love about Bonaire! It is called Divers Paradise for a reason! Surrounded by coral reef with easy access from the shore (just walk-in) or short boat rides there are about 100 dive sites to explore. After getting your Marine Park Tag ($25 per year) you can snorkel and dive as much as you like. Yellow painted rocks mark the dive sites and you can park right in front of the water entrance most of the times. The West coast offers mostly current-free diving while the East coast is called the wild side with high waves and strong currents, but also offering Sharks, Eagle rays and schools of Tarpons. Read more here: Getting THE BEST out of SCUBA DIVING BONAIRE! When the donkeys were released from labor due to modern ways of transportation they were set free on the island. As they do not belong on the island surviving is hard. Searching for food, water and shelter but also the risk of getting hit by a car. Donkeys walk in to town for food and that gives a whole lot of problems. The Donkey Sanctuary Bonaire was created to rescue and take care of the donkeys. Hundreds of donkeys can be found in the sanctuary and you can drive around the huge 'park' for $7 each. Now this visit is something special! The donkeys are so used to people feeding them they will try to get in your car for food. We brought two bags of carrots from the supermarket and it was gone before we knew it! It was hilarious and sweet! When we opened the car windows they stuck their heads inside without any fear, it is just too funny. This is a must visit on Bonaire, and do not skip their lovely souvenir shop. You can even adopt a donkey if you like! This is a link to the website of the Donkey Sanctuary Bonaire. With crystal clear water and a turquoise blue lagoon Lac Bay in Sorobon is the place to be on the island for Caribbean vibes and wind surfing. No shoes, no shirt - no problem! Especially their colorful beach bar called Hang Out Bar is the place to be for cocktails with your feet in the water while watching people wind surf. Make sure to try the homemade sangria here! One of the things you have to do when you are on Bonaire is mangrove snorkeling around Lac Bay. The tours are guided by a naturalist which makes it very educational. Kayak to a secluded bay to explore future marine life generations! We booked the 2-hours kayak & snorkeling with The Mangrove Information Center Bonaire and we absolutely loved it! It was beyond our expectations (see video). Read more here: Snorkeling in a Mangrove Forest on Bonaire!. Did you ever drink a cactus?! It is possible on Bonaire! 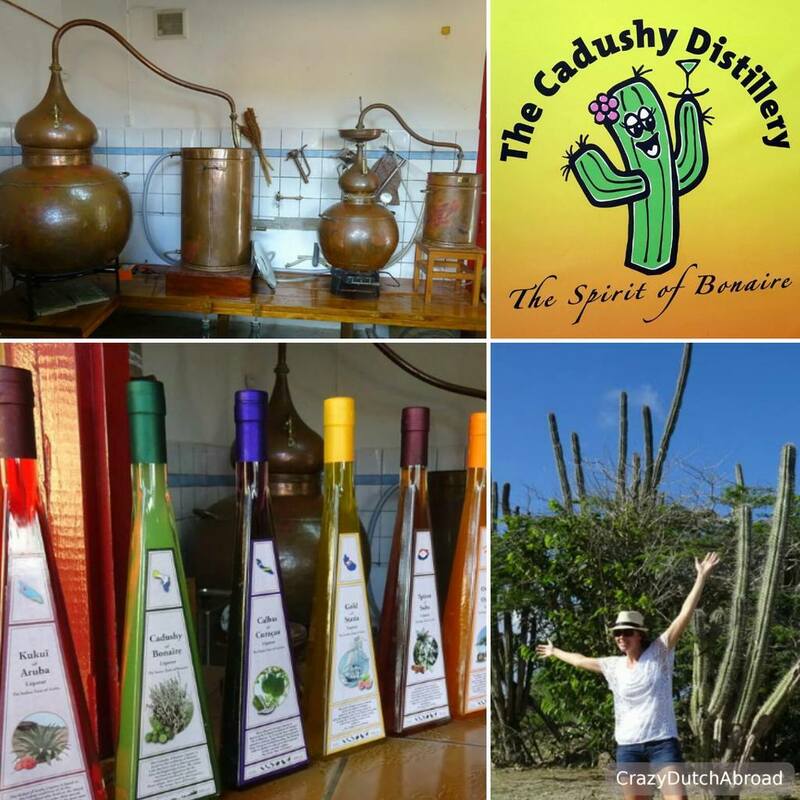 If you visit the Cadushy Distillery you get a great explanation of the process & (maybe the best part) FREE tasting! The distillery is located in Rincon. Make sure to plan this trip when there are NO cruise ships around to avoid crowds. 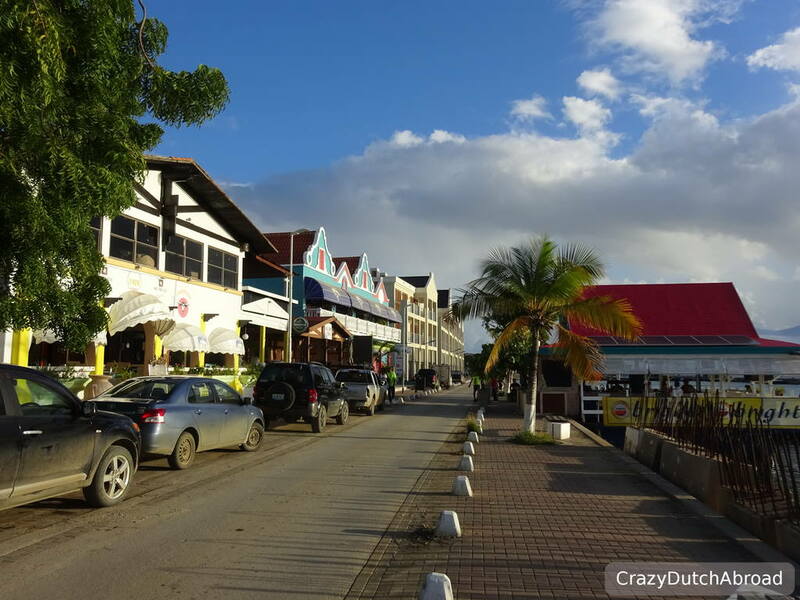 Dutch and Papiamentu are the official languages of the island but Spanish and English is spoken just as often. All successful businesses seemed to be run by non-natives although there are many signs around the island with the word 'makamba' on it, a swear word for European Dutch people. During the day you can find many locals sitting in front of their houses, drink a beer and just relaxing. 'Bon dia! Kon ta bai?' means 'Good morning! How are you?' in Papiamentu. 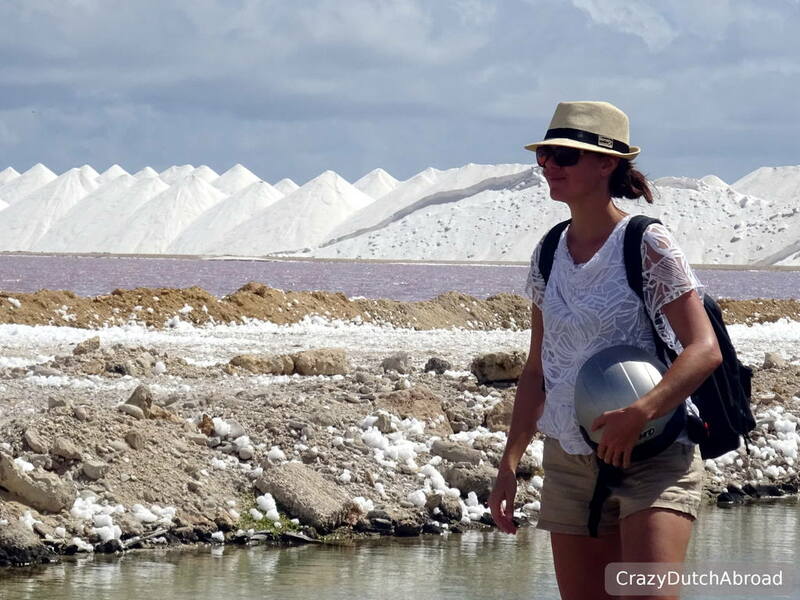 You will see Dutch tourists, hear Dutch everywhere and you can buy hundreds of typical Dutch products on Bonaire. There is even a famous Dutch supermarket on the island: Albert Heijn. From all kinds of Dutch cheeses to my favorite Dutch cookies: stroopwafels (syrup waffles) and different types of liquorice. Fresh pickled herring is even sold in a traditional Dutch fish shop (see below). For us this is great after traveling for another year, it felt like a home away from home! The prices are higher than in The Netherlands since it is all imported. Ordering a portion of bitterballen (meat-based snack) in one of the restaurants (they all seem to have them even-though it is often not on the menu) is a real treat. We only tried a few traditional Bonairian dishes as it is pretty hard to get since most local restaurants seem to be open whenever they like. Other than Bonairian restaurants you can find a lot of Chinese, Suriname and Italian restaurants but also a Japanese, Argentine, even a Middle Eastern and Indonesian restaurant. Plenty of choices during your holiday! Apart from the food and the Dutch town hall being different the traffic is a major difference from the (European) Netherlands. 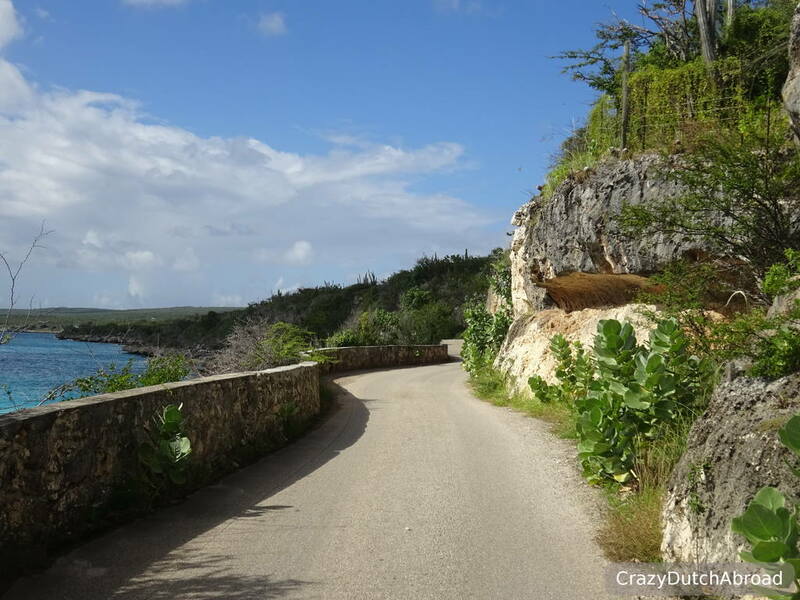 Since it is a small island there are no traffic light, that might not surprise you, but wearing no seat-belt and driving drunk is part of life around here. In the weekend, young locals take over the boulevard after sunset with their scooters and pimped cars while trying to impress people with their loud sounds and slipping skills on the roundabouts. There are pedestrian crossings but DO NOT expect a car to give you priority! Do NOT start crossing the street with the idea of cars stopping for you, it will likely only happen if a tourist drives the car. Cross fast or wait until all cars are gone! Another thing is that The Dutch Caribbean is not part of the Schengen Agreement, we can stay up to 3 months per half year as Dutch citizens. Did you know the US dollar is used on Bonaire instead of the Euro or Antillean guilder (also called the florin)? Even the power inlet is American. We have had quite some rain and cloudy days over the last month on Bonaire, apparently after hurricane Matthew. A scenic propeller flight over Bonaire must be the best way to get an overview of both islands and some great photo opportunities. We might do this when we come back in a few weeks. Probably the weather will be more stable as well, a crystal clear sunny sky would be perfect for a trip like this. 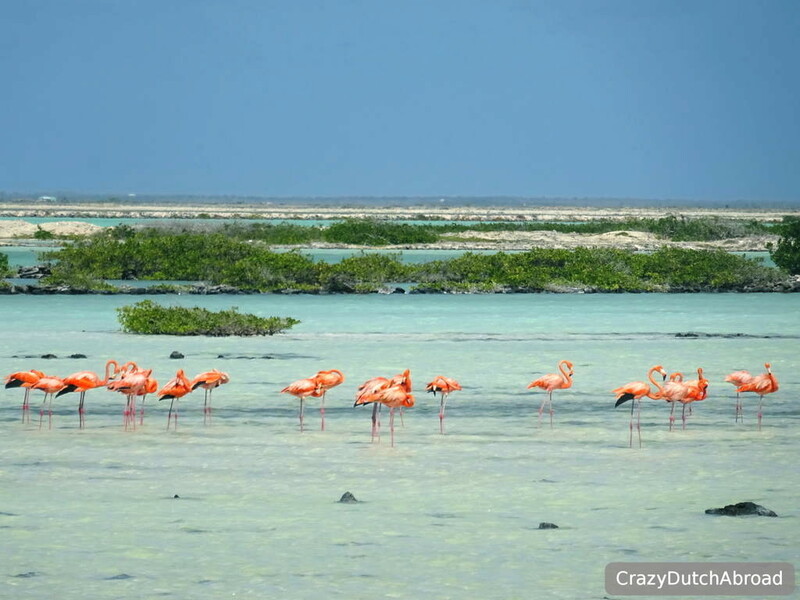 This natural reserve offers many flamingos, parrots, iguanas and many other animals as well as an impressive landscape and interesting dive sites. There was a rain the months we were on Bonaire, the Washington Slagbaai Park has been closed often due to slippery roads. As we also did not have our own transportation and you need a 4wd to enter the park due to the dirt roads. Renting a 4wd for a single day will cost about $80 with taxes & insurance, most companies rent from 3 days onward. On Bonaire it can be pretty hard to find local food, especially served in a local setting. Some places serve local food, most of those places are open whenever they feel like it and often they close late afternoon. Rose Inn in Rincon is one of the hot spots for local food on the island. Since we did not have our own transportation we went there on the days we rented a scooter and guess what? Both times we went there they were closed! Bummer! Maybe next time. Spots we loved Top 5 Bars: Hang Out Bar (Jibe City), Little Havana, La Balandra (inside Harbour Village Beach Club), Rum Runners (Don's Habitat) & Coco Beach Club (all great for oceanfront sunset). Quality of local food Average, fresh ingredients are often hard to get due to shipments. Scooter/car rental About 25$ a day for a scooter. Cars need to be rented at least 3 days (high season) and cost about 80$ per day last minute with taxes and insurance. Local transport There is no real public transport. Most people rent a car or bicycle, locals hitchhike. Apartment We stayed at My Own Paradise Resort for $850 per month, without Pagabon prepaid electricity. This is a basic accommodation, downtown, with a swimming pool, equiped kitchen, air-conditioning in the bedroom and a cold shower. Nice hotel Dive Hut offers rooms with air-conditioning and hot shower from $60 a night. UMTS Outside of Kralendijk UMTS is often not so strong. WIFI Hot spot Free WIFI is offered all around the island. It is easy to get around without a local SIM unless you need it 24-7. All internet connections seem to be down every once and a while (something to do with the satellite). Having several providers is a more secure option. Not so much Bonairian local but 100% Dutch! Buying a fresh herring (Haring)! We visit this shop about 3 times a week! LOL.